Lola Omolola is the founder of FIN, a private Facebook group with nearly 1.7 million members that has become a support network for women around the globe. Lola Omolola's success comes from a few strategies: curating interesting stories and encouraging women to respond to each other. She's the founder of FIN, a private Facebook group — with nearly 1.7 million members — that has become a support network for women around the globe. FIN originally stood for Female in Nigeria, but as its reach grew to other countries, Omolola recast it simply as Female IN. Its genesis can be traced to 2014, when nearly 300 girls were kidnapped from a boarding school in Nigeria by the Boko Haram militant group. 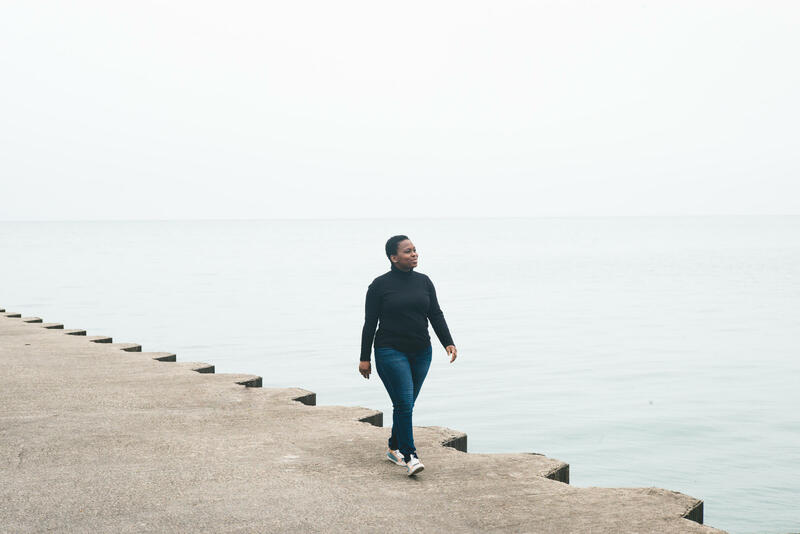 "Whenever I turned on the radio and television, everyone was talking about the terrorism angle," recalls Omolola, who grew up in Lagos and now lives in Chicago. For her, the kidnapping represented the worst form of patriarchy: men were targeting young women for getting an education. Omolola says it shook her and she needed a way to be part of her country's mourning and healing. So she turned to Facebook and started the group. "I didn't know what I was going to do," she says. "I just knew I wanted to find them at the very least, so that I wouldn't be by myself, because I felt really lonely." But Omolola turned that loneliness into action. The group scaled up quickly. First she invited friends, who invited friends. She organized real-world meetups and encouraged women to respond to each other respectfully. Omolola also shared stories she found on the Internet, mostly on Facebook and Twitter, about women's issues. One story was about a woman in Nigeria who wanted to get her hair cut short, like a boy. The hairdresser told her she needed a permission slip from her husband first. Omolola posted the story, figuring FINsters (as she calls them) would likely discuss it, "like pundits do," she says. But that's not what happened. Instead, women started sharing their own similar experiences in the comments thread. "This was a shock to me," she says. The group has since had many threads on women, their hair and their husbands. FIN has taken on far heavier issues too, like domestic violence. Before the #MeToo movement broke the silence around widespread sexual assault, FIN encouraged women to share their stories. "Most of us just didn't realize how widespread the practices were because we'd normalized them," Omolola says. One time, she noticed a comment on one of the posts — about a woman who was dragged through the streets by her husband as people watched and did nothing. She messaged the FINster. "She broke down, told me it was her," says Omolola, who asked for permission to write up the story and name the woman. The woman said yes. NPR spoke with the woman, whose first initial is O. She didn't want NPR to use her name, for privacy concerns. But she felt confident and safe enough to share her story and her name in Omolola's group because FIN is private. "I just got tired of hiding. I just got tired of trying to put up a happy face when I'm actually not happy," O says. She decided to leave her husband for a while, supported by FINsters who offered donations, prayers and even housing. FIN's members are women — mostly in Nigeria, but also in the diaspora. Popular posts regularly get half a million views. The group has grown through word-of-mouth. Omolola's success with FIN comes from a few strategies: curating interesting stories and encouraging women to respond to each other. She and others organize real-world events where group members can meet. Events have been held in cities around the world, including Lagos, Johannesburg, London, Houston and the Washington, D.C., area. Strict ground rules are enforced by a team of more than two dozen moderators. Among the rules: do not judge, do not share outside the group, do not give unsolicited advice. When Fatty Giwa Abdulrahman joined two years ago, one of the first posts to catch her attention was from a woman who talked about fertility issues similar to her own. "I didn't know a lot of people went through that," she says. "It made me really comfortable." She began chatting with the FINster directly, staying in regular contact. And when, in a tragic turn of events, the FINster lost her daughter, Abdulrahman wrote her first post, to mourn the baby's death. The group has grown fast, and its success has piqued the interest of Facebook leaders besides Zuckerberg. At F8, an annual developer conference that typically features the work of software engineers, long-time Facebook executives Chris Cox and Ime Archibong cast a spotlight on Omolola's work and attendees took notes about how she uses Facebook's tools. "She's exactly the type of person that we're excited about — a builder who is passionate about using technology to drive positive social outcomes," Archibong says in an email to NPR. Facebook has lost the trust of users after reports revealed the company let 87 million profiles fall into the hands of a political operative. But Omolola's group is proof that the social network can build "meaningful communities," making her a much-needed success story for the company. Last year in Chicago, at an invite-only event, Zuckerberg announced Facebook would change its mission — from connecting friends to building communities. And he interviewed Omolola on stage, about how she got real-world results by using the online platform to break the silence around domestic violence. "Now, when someone posts in your community, they're going to get thousands of messages of support, and offers of places to stay and help with child care, all within minutes," he said, recapping the work of FIN. 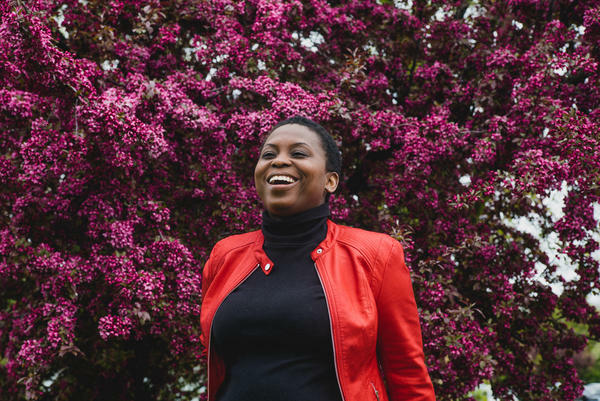 For Omolola, Facebook is a godsend — a technology that enabled an immigrant woman in Chicago to have a global voice. She believes the platform can be used for a lot of good — if that's what's in people's hearts. All right, this next one is a question for the ages - or at the very least, for our age. Does social media make us more connected or does it make us lonelier? For now, we do not know. The science isn't conclusive, but there are a lot of interesting anecdotes. NPR's Aarti Shahani has the story of a woman who's using Facebook to build a movement for women's rights. AARTI SHAHANI, BYLINE: Facebook has more than 2 billion users. And last year, at an invite-only event, Mark Zuckerberg introduced one of the most influential. MARK ZUCKERBERG: You know, a few weeks ago, I had a chance to meet Lola Omolola. Where are you Lola? SHAHANI: Loma Omolola runs a wildly successful group for women on Facebook. She has nearly 1.7 million members. Her group has grown organically - word of mouth - and turned her into a major Facebook success story. Company leaders pick her brain, study how she uses Facebook's tools, and last month, they flew her out to California to star at their annual conference. LOLA OMOLOLA: I just feel like the universe is coming together to validate me in some way. UNIDENTIFIED PERSON: How do you mean? SHAHANI: Omolola is a 41-year-old mother of two. She looks younger in her bubble gum pink T-shirt and beige leather jacket, her hair in a short Afro. Sitting in an armchair at a hotel in Cupertino, she tells her group's origin story. It starts in 2014, when nearly 300 girls were kidnapped from a boarding school in Nigeria. OMOLOLA: Whenever I turned on the radio and television, everyone was talking about the terrorism angle. SHAHANI: Boko Haram - Islamic militants - did the kidnapping. But Omolola saw another angle - patriarchy. She saw men targeting young women for getting an education. She needed a way to be part of her country's mourning and healing. She's from Nigeria but lives in Chicago, far away from the protests and prayer vigils back home. So she turned to Facebook and started F-I-N - FIN - Female IN Nigeria, a support group for women. OMOLOLA: I didn't know what I was going to do. I just knew I wanted to find them - at the very least - so that I wouldn't be by myself because it feels really lonely. SHAHANI: Omolola invited friends, who invited friends. They organized meetups for members to socialize in the real world. And she found anecdotes on the Internet to share about other Nigerian women - for example, this one about a woman who wants to get her hair cut short like a boy. The hairdresser says, no, she needs a permission slip from her husband first. Omolola figured FINsters, as she calls them, would discuss the situation. OMOLOLA: But guess what happened? And this was a shock to me - I think still is. SHAHANI: I want to guess. OMOLOLA: Tell me. Tell me. SHAHANI: My guess is that people started sharing their own experiences like that. SHAHANI: Another time, Omolola was struck by a comment buried in a long thread about a woman who was dragged through the streets by her husband as people watched and did nothing. She messaged the FINster, who, it turns out, wasn't talking about someone else. It was her. NPR spoke with the woman. We'll call her by her first initial, O.
O: I just got tired of hiding. I just got tired of trying to put up a happy face when I'm actually not happy. SHAHANI: O doesn't want to use her name for privacy concerns, but she let Omolola share her story, naming her on FIN, because, O says, it's a private group, and there are strict ground rules like, do not judge. A team of moderators enforces these rules, stepping in to delete personal attacks. FINsters responded to O with supportive notes, financial help, two offers for housing, and O left her husband for a while. When she decided to return to him - she says they're working things out - some group members were upset. But O recalls the message she got from Omolola. O: You have my support. You found your voice. Make sure you do not lose it. And that was all I needed to hear. SHAHANI: Omolola, who is trained as a journalist, has become a digital organizer, and she says her members are her mission. OMOLOLA: There are women who, their entire lives, have been carrying such burden. SHAHANI: Her eyes well up as she talks, and I ask what a lot of people have asked her - if something terrible happened to her. She says no, that both her father and husband encouraged her to be outspoken and helped her to believe in herself. OMOLOLA: I know what true love feels like. I want that for everyone. That stuff isn't complicated. SHAHANI: Back at that event last year with Mark Zuckerberg, he spotlighted how Omolola's work is having consequences he never expected by breaking the silence around domestic violence. ZUCKERBERG: When someone posts in your community, they're going to get thousands of messages of support and offers of places to stay and help with childcare all within minutes. SHAHANI: In recent months, Zuckerberg has been very busy apologizing for Facebook's many failures. But Omolola believes his technology can be used for good if that's what's in people's hearts. Aarti Shahani, NPR News, San Francisco. (SOUNDBITE OF OAKTREE'S "MOLECULE") Transcript provided by NPR, Copyright NPR.